It’s been a non-stop ride of home improvement since we moved into our new home in November! 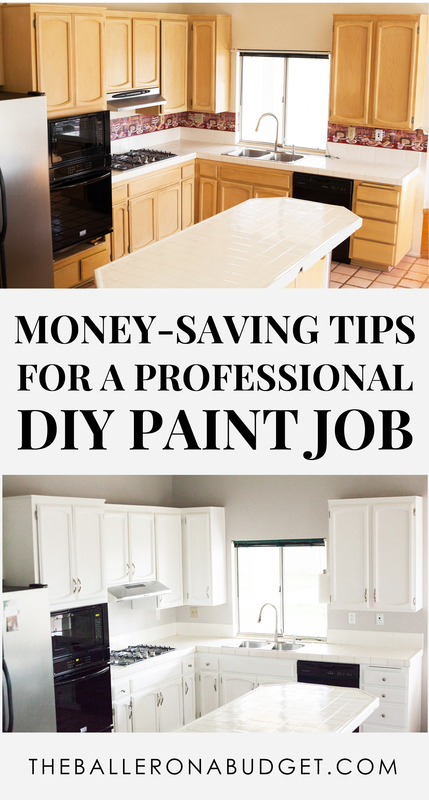 Aside from painting the kitchen cabinets we’ve been doing tons of mundane things probably not worth sharing on the blog like changing out toilets, fixtures, sinks, stretching the carpet etc. but boy, we’ve been busy. 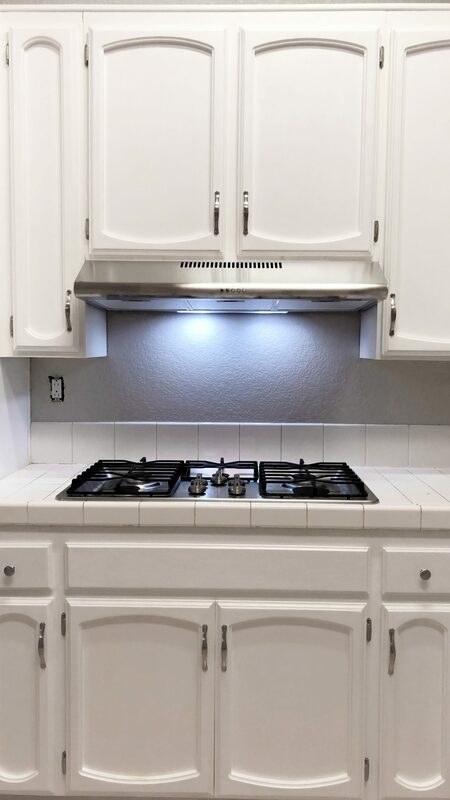 On top of the outdated cabinets, the walls were also an eyesore: flat beige paint, knockdown texture, popcorn ceilings and tons of nail holes, I felt like a fresh coat of paint would completely transform and modernize our space. While slapping up some paint might seem like a straightforward task, it’s far from it! Before you start your own paint project, be sure to read through this post for tips that will give you the best paint job. A popular choice of paint amongst many interior designers and bloggers is usually Benjamin Moore. Although they carry gorgeous colors, great warranties and opaque finishes, Benjamin Moore costs a whopping $68 per gallon for their best-selling Aura Interior paint, which is hardly enough to finish a room! If you have an older home that has knockdown wall texture like mine, pricy paints that promise a one-coat coverage may still require a second coat. Textured walls have crevices that may not grab paint on the first coat, so this is an important factor to consider if one-coat coverage is important to you. Cheaper paints may not offer an opaque application or extended warranties, but they can also color match paint colors from other brands. All you have to do is give them the name of the brand and the color and their computer can mix the pigments to match the exact formula. 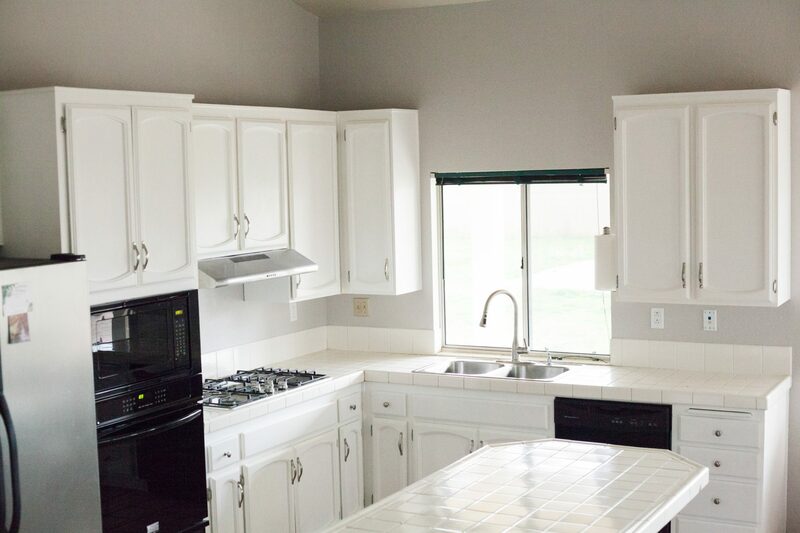 I’ve used Behr in my previous homes and have had no issues with their quality of paint. The value is great at $36.98/gallon for their mid-tier Premium Plus Ultra paint-and-primer, but they also offer Premium Plus paint at $28.98 and Marquee paint at $45.98. However, I highly recommend Premium Plus Ultra as it is a great-quality and reasonably-priced paint formula (FYI, this is the paint I used for this project!). There’s also no need to use a primer with this formula. You can also save a few more dollars if you buy a 5-gallon bucket. Premium Plus Ultra is $150 for a 5-gallon bucket, so you’ll be paying only $30 a gallon when you buy in bulk. 5 gallons covered about half my 2,000 sq. ft. home, so you can approximate how much paint you need using your square-footage as well as the height of your walls. There are also some perks in choosing pricier paint. 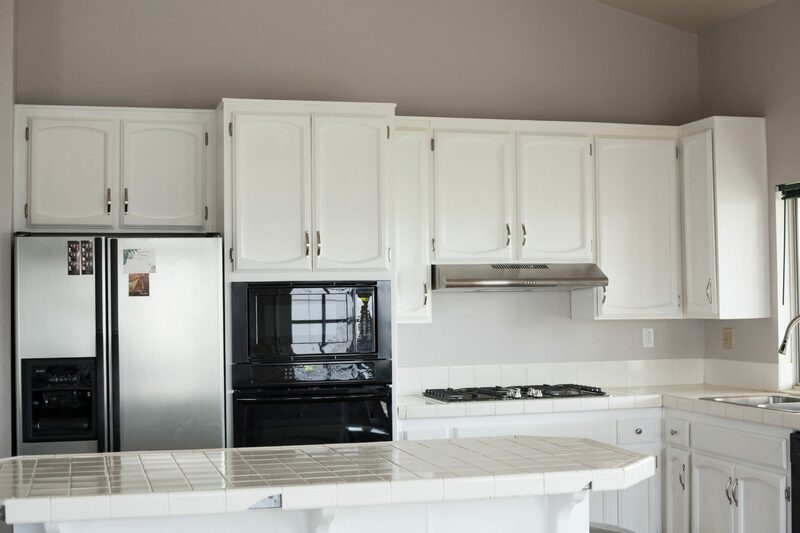 If you’re planning on hiring painters, it might be better to go with Benjamin Moore. Since painters charge hourly, a cheaper paint that dries slow and requires multiple coats may cost you more in labor, whereas a more expensive paint that dries quickly and offers a more opaque coverage can get them in and out of the door quicker. 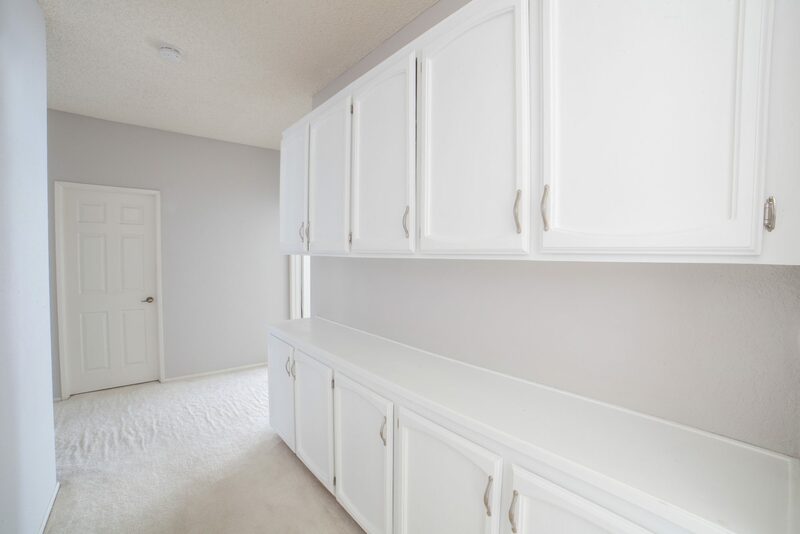 If you aren’t hiring painters but still desire a pricier paint, you can still cut costs by using it in the main areas of your home and then using a cheaper color-matched brand in more obscure areas like closets or spare rooms. It’ll be your dirty little secret. Gloss, Semi-Gloss, Eggshell or Flat Finish? I feel like many people neglect the importance of choosing the right finish as I don’t think you should use the same finish for every room in your house. Each finish serves a specific purpose! Gloss: Gloss is the easiest to clean, but in my opinion, a bit retro and dated. If you entertain a lot, keep in mind that glossy walls will give you camera glare in photos when you use flash (and sometimes even without it). This finish is generally recommended in areas exposed to grease or steam on a regular basis such as the bathroom or kitchen. 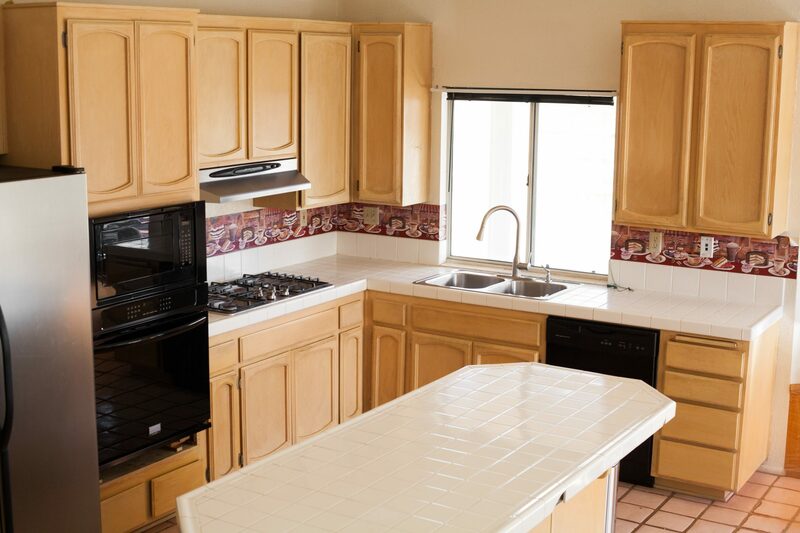 If your walls in high-exposure areas have a protective tile backsplash, you may not need glossy paint. Semi-Gloss: Basically just a less glossy version of the standard gloss. If you must get a gloss finish for protective reasons, I’d recommending going with semi-gloss as it’s more subtle. Eggshell: A crowd favorite. Eggshell finish is exactly what it sounds like when compared to the smooth and almost-matte finish of an egg. It’s still easy to clean and wipe down (a considerable factor if you have kids or wear shoes in the house) but appears almost matte. I wound up using eggshell for my home and even on the wall by my stove is still easy to clean. Flat: Flat or matte paint may look beautiful on walls with wainscoting trim, but it is extremely hard to clean. A simple scuff or stain can be impossible to wipe down, and with a wet rag you might make an even bigger problem. The best way to touch-up stains or marks is with fresh paint, but it might wind up looking blotchy and uneven when painted over older paint. Picking the right color is much more critical than people assume it is. Although many paint stores offer free paint catalogs and paint chips for you to take home, I still encourage you to get several shades in 8 oz. sample jars to try them on various walls in your home. Paint a large portion of your wall – not just a small section – at least 4 x 4 ft. large. Painting a larger-size swatch on your wall allows you to see how the shade interacts with your window light as well as artificial light in the evening. Of course, I didn’t take my own advice because I was in a rush, and while I’m happy with my color choice I think I could’ve gone a little warmer to offset the purple tones it gets during midday. 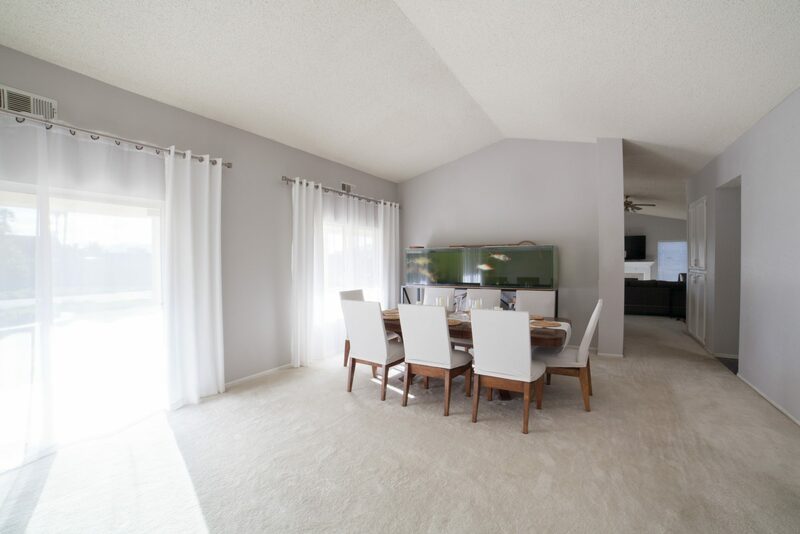 Paint colors literally transform throughout the day, and nuances such as what direction the windows are facing or what temperature your lightbulbs are can make a simple grey paint look brown, purple or any other shade. In fact, my grey paint looks lilac during midday! So be sure to take your time selecting the right color and don’t rush through the process. Also consider that every color will have a variety of hues ranging from warm to cold to match your room’s lighting, so never purchase a neutral color like white or gray without swatching it first. Neutral colors are not “foolproof” as many think, and may oftentimes be the hardest to choose! After seeing Benjamin Moore’s Barren Plain many times on Pinterest and also being recommended by my friend WanderxLuxe, I decided to get it color-matched in Behr’s Premium Plus Ultra Eggshell Finish formula from Home Depot. 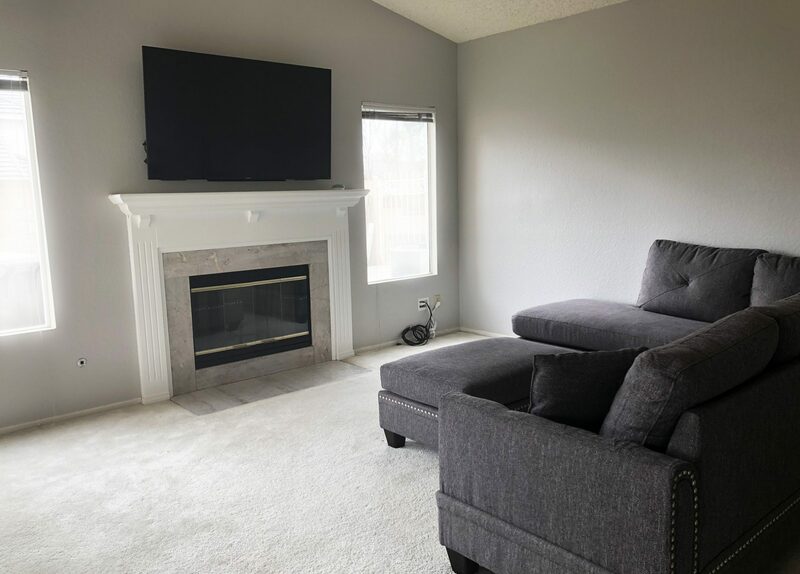 It looks beautiful against my white cabinets (General Finishes Milk Paint in Snow White), matches my dark grey furniture in my master bedroom and will pair beautifully with the black wood floors I plan on replacing our current flooring with. Clean your walls. 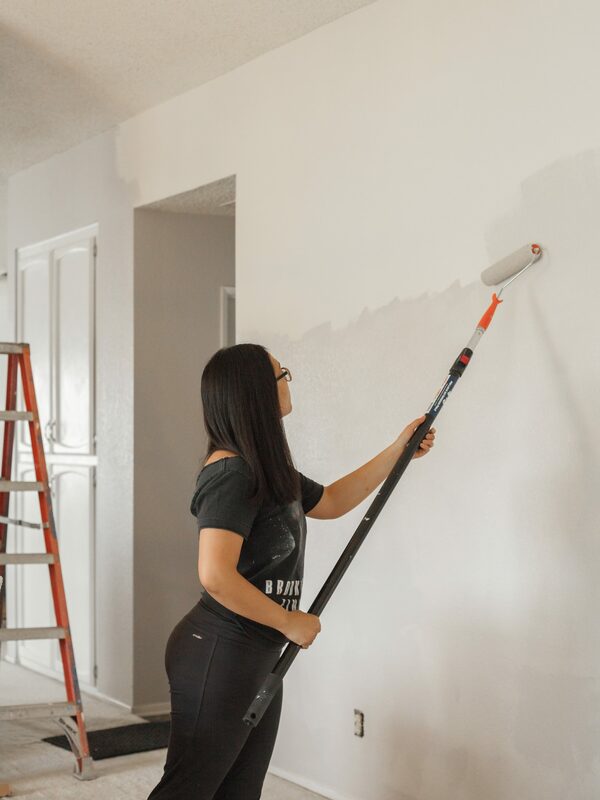 Prepping your walls properly assures that the paint will stick. Remove any nails and screws, patch holes using a spackling putty and knife, vacuum any dust and cobwebs, sand down uneven texture, and clean off grime. Protect your furniture and floors. Using the canvas or plastic drop cloth, cover the floor closest to the wall and adhere the plastic with Frog Tape. 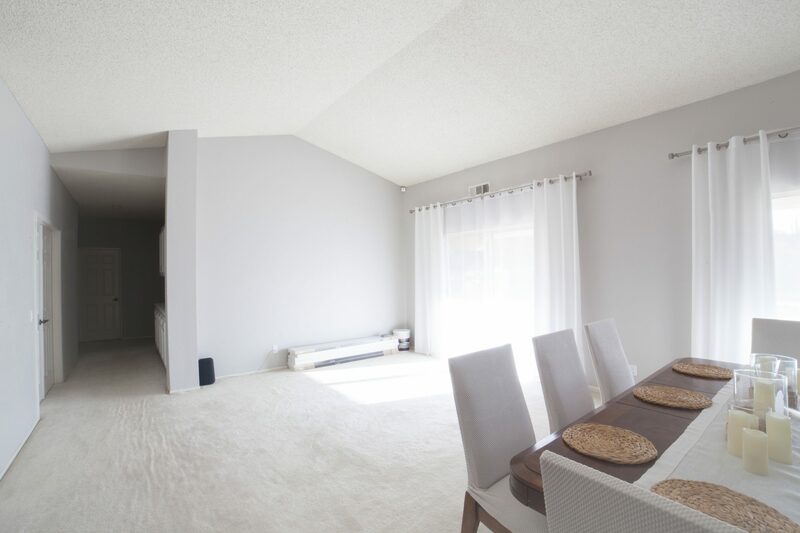 Move any furniture out of the way or cover with an additional drop cloth. Unscrew your light switches and outlets. This will guarantee a clean paint job and you won’t have to paint around these fixtures. All you need to do is take a flathead screwdriver and unscrew the screws on the outlet. Mix your paint. Mixing your paint prior to using it assures that the pigments will not settle to the bottom. Be sure to always do this before each paint session, even if it’s the same can! You can either use the free wooden sticks the paint store provides or a drill and the paint mixer attachment. 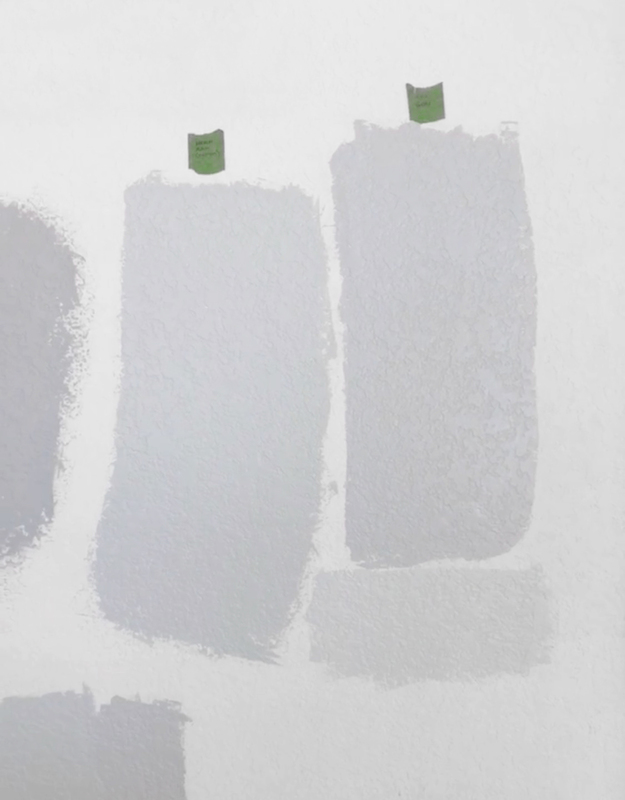 If you start painting immediately after you bring it home from the store, you can skip this step as they’ve already mixed it. Use a pouring spout. I highly recommend using a spout to prevent making a mess and getting paint everywhere. 5-gallon buckets are extremely heavy to pour, so replacing the cap with a $2 spout will prevent the possibility of a spill. 1-gallon pouring spouts double as a lid and keep the job clean. Paint in V and W shapes. This assures better coverage, especially on textured walls, instead of going up and down or side to side. I zig-zag left to right a few feet and then continue just below it. Be generous with your paint on your roller. If you apply enough paint, you can get coverage in 1-2 coats. I was able to get opaque coverage in just one coat by using enough paint and touching-up in small areas. Be sure that your roller isn’t dripping, but has enough paint so that the roller isn’t dry. Paint extension poles are a game changer. If you don’t have a ladder, you can get a long enough extension pole that’s adjustable so you can reach the higher areas. Use a paint edger. Although I love Frog Tape, even the stickiest of tape won’t adhere if you have older baseboards with tons of grime on them. I’ve found that it’s generally easier to use a paint edger that rolls along the edges to provide a crisp line. The Pro paint edger also attaches to paint poles so you can line the edges of your ceilings with ease. Tip: Instead of dipping the edger into the paint, brush the paint onto the edger so that the paint doesn’t seep onto the edges and ruins your lines. If you feel comfortable, use a brush for edges. 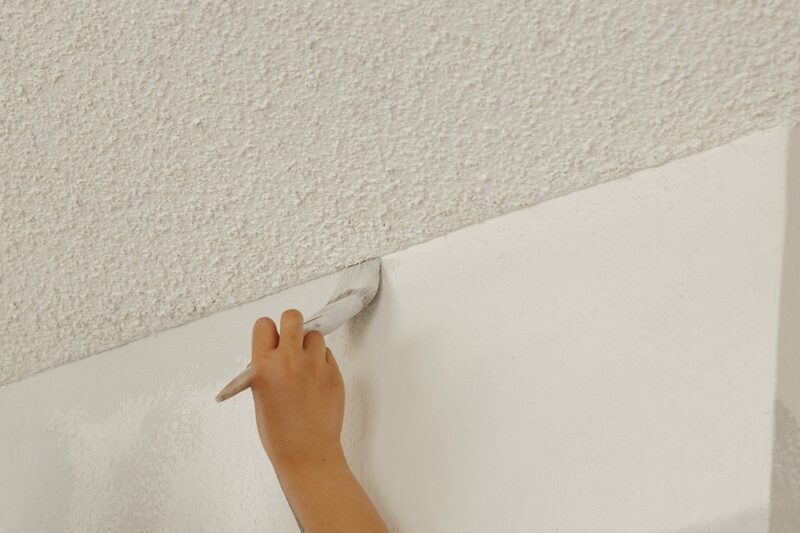 My popcorn ceilings don’t allow me to use the paint edger (I wind up knocking off a bunch of popcorn off), so using a brush with flexible bristles makes it easier to free-hand paint edges (I love Wooster flat and angled brushes for this). I save a lot of time painting the edges around doorframes too! Ultimately, this will save you money on buying painter’s tape – and it’s not as hard as you think if you get a good brush. Use a wet rag to clean up any mistakes. Always keep one nearby in the event that you accidentally get paint on any trim or the floor and wipe it off as soon as it happens. Always wash out your brushes after use. Don’t let your brushes or tray liner dry after you paint. Paint dries much more quickly than you think, so as soon as you’re finished rinse them off outside on the lawn or in the gutter (you can spray it down so that the paint doesn’t stick to the lawn) – don’t flush the paint down the drain. Use a brush comb to get any dried parts of paint out and to assure all of it is removed. Remove the tray liner from the metal tray so it doesn’t rust, and lay the brushes out to dry. Are you inspired to give your space a makeover with new paint? Let me know in the comments below! 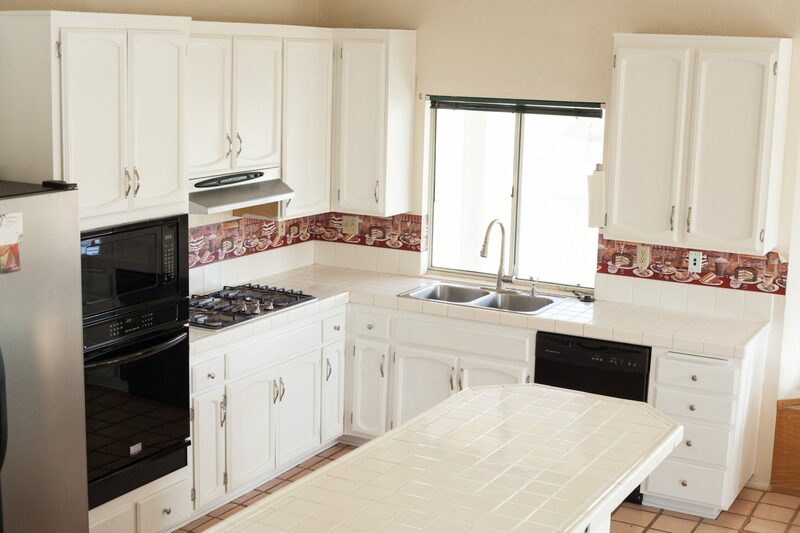 Don’t forget to subscribe to my newsletter and follow me on Instagram for more affordable home improvement tips and tricks.